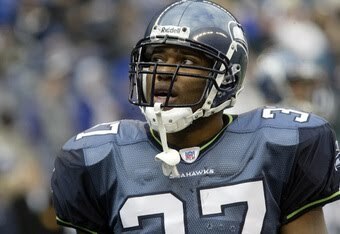 After rushing for 3565 yards in college, including 1383 as a senior when he was SEC Player of the Year, Alexander was chosen by the Seahawks in the 1st round of the 2000 NFL Draft. He backed up starting RB Ricky Watters as a rookie, rushing for 313 yards on 64 carries (4.9 avg.). Alexander started the ’01 season behind Watters but, when the veteran was injured, broke into the starting lineup. Seahawks went 9-7 to finish second in the AFC West (their last year in that division before being realigned into the NFC West). The thousand-yard, double-digit touchdown season in 2001 was the first of five straight for Alexander. He also improved on his pass receiving and blocking. He was named to the Pro Bowl following the 2003 thru ‘05 seasons, rushing for 1435 and 1696 yards in ’03 and ’04 before leading the NFL with a career-high 1880 yards in 2005. He also scored a then-record 28 touchdowns that year as the Seahawks won the NFC Championship and he received consensus MVP honors.Alexander signed an 8-year contract extension but broke his foot three weeks into the 2006 season and was limited to just 10 games, gaining 896 yards rushing, including 201 on 40 carries against Green Bay. After a less productive year in ’07, in which he suffered a series of nagging injuries, he was released. Alexander joined the Redskins during the 2008 season, to provide depth following the loss of backup RB Ladell Betts, and ran the ball just 11 times in four games in his final year at age 31. Overall, Alexander rushed for 9453 yards on 2187 carries (4.3 avg. ), caught 215 passes for 1520 more yards (7.1 avg. ), and scored a total of 112 touchdowns (100 rushing, 12 receiving). 9429 of his rushing yards, and all of the TDs, came with the Seahawks, making him the franchise’s career leader in both categories.